Fairy House Escape info about the game-Games2Rule. 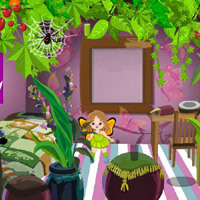 Fairy House Escape is another type of point and click new escape game developed by Games2rule.com. In this game one dove is trapped inside the fairy house while she went for search of some food. She needs someone to escape from there. Do you want to help her? This time use your escaper mind for that dove and bring out from the fairy house. Search for some useful object s, solve the puzzles and escape the dove. Good Luck. Have fun!